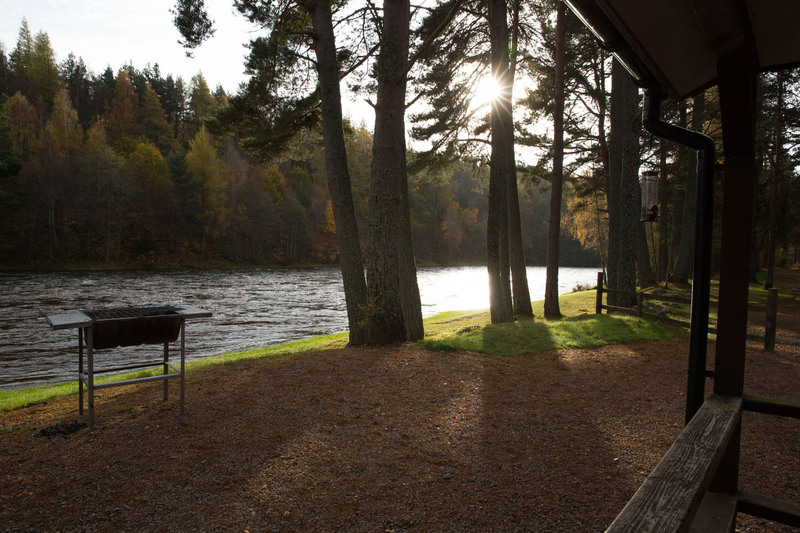 Fishing on the River Spey is sought after, as is a relaxing fishing hotel for your Scottish Highland holidays. Many a keen fisherman would love the challenge of catching a 40lb salmon from the fast flowing Spey set in magnificent countryside in the Highlands of Scotland accompanied by a professional ghillie on a Scottish estate. I spent several hours with the head Ghillie, Lionel, of the Seafield Estate, on a crisp Autumnal day. The trees were an array of beautiful colours and the river Spey was flowing high as we moved along Beats 1, 2 and 3, a total of 20 miles of prime fishing locations along the river Spey of Castle Grant on the Seafield Estate. Lionel talked of his wealth of experience fishing on the Spey, the comradery of fellow fishermen/women during their fishing trips and the size of some of the salmon that have been caught over the years. We went to beat 1 via heather-land with roaming capercaillie, on arrival at beat 1 the low winter sun beamed throughout the ancient scot’s pine and reflected on the fast-slowing Spey. I was shown around the fishing ‘hut’, a cabin set out with cooking and dining facilities for enjoyment of the catch of the day. Records of the best catches adorned the walls, from 20lb salmon in 2001 to a 30lb catch in 2012 and an amazing 40lb catch more recently. Fishing on the Spey is both challenging and relaxing, an oxymoron in itself. The challenges of the eagerness to catch the best salmon and the relaxation of some of the most beautiful settings in the world. Wilkepedia states that ‘the river is known by anglers for the quality of its salmon and trout fishing, including a particular form of fly fishing where the angler uses a double-handed fly rod to throw a ‘Spey cast’ whereby the fly and the line do not travel behind the fisher (thereby keeping these away from the bushes and trees lining the banks behind him or her). This type of cast was developed on the Spey’. If you fancy Salmon Fishing in the River Spey, fly fishing only. Alba are a tour operator and fishing guide company. Click Here to go to their website and find out more about what Alba provide. 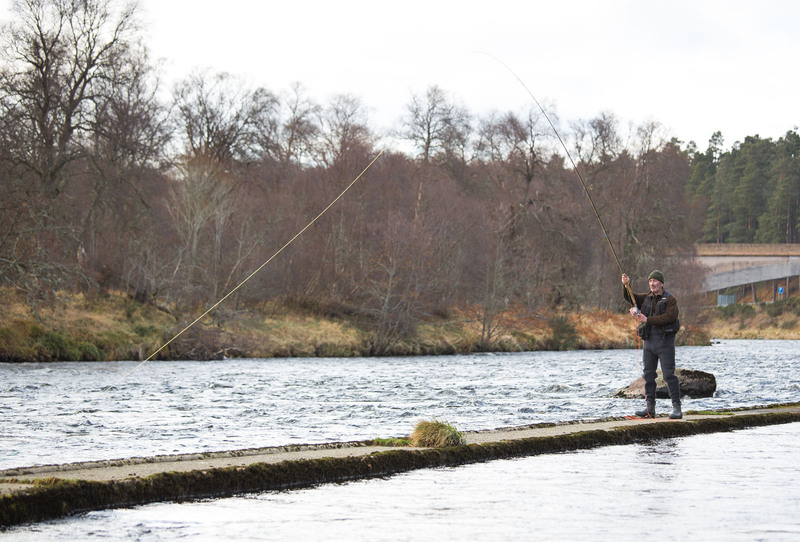 Fishing days and weeks are available on the Seafield estate with a ghillie and some of the best beats on the river Spey. Join the ghillie and enjoy some guidance if you have room for improvement or allow the ghillie to BBQ your catch of the day and enjoy their wealth of knowledge about fishing, the Spey, the estate and Scotland. Fishing on the Spey can be arranged through ourselves at Muckrach Country House Hotel or directly with the Seafield estate. Fishing equipment purchase and hire can be arranged through Mortimer’s in Grantown on Spey. You can enjoy the warmth of our luxury fishing hotel by night, dine in the Grant Room (your party’s own private dining room), relax in the whisky bar and sleep like you’ve never slept before in our bedrooms. If you wish to book a fishing holiday please get in touch.